Correctly calculated wind direction and speed does not change with the boat's sailing condition. True wind is a tricky thing to get right. Any error in the inputs throws off the output, causing the true wind to change with the sailing conditions. 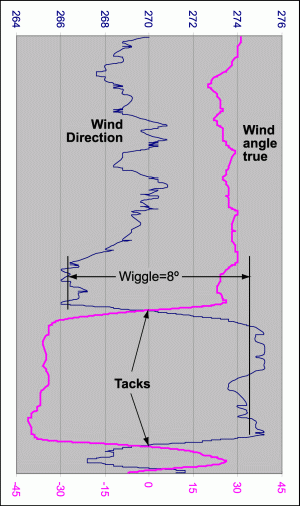 There is a good way to test for a valid solution: by seeing how much the wind direction changes when you tack or gybe (the 'wiggle'). Ground relative. This is the 'normal' way of thinking when on land. "Wind's from the nor'east at 60". If you strapped an instrument on a car and drove around, the wind direction would always report as 45° (ignoring magnetic variation of course). All meterology is earth-based and true north oriented, so earth-true is the number you have to use when route planning. Using earth-based boatspeed & heading prevents the calculation of current.